I’ll not waste time repeating the dust jacket or give away spoilers, this is simply my thoughts about Blue Labyrinth. The suspense/thriller genre is crowded with interesting, exciting protagonists, but Agent Aloysius Pendergast, is in a class of his own. A Chongg Ran practitioner, with an extensive knowledge of food and wine, and unparalleled verbal skills. His appreciation of finer things always on display – designer suits, handmade shoes, a grand mansion on Riverside Drive, a lovely apartment in the Dakota, and his chauffeur driven 59 Rolls Royce. Blue Labyrinth is the 14th novel in this series and while all of them have been “good”, some definitely shine brighter than others, as I’m sure is true of any long running series. The story weaves together the murder of Pendergast’s son, (Alban), and that of a Museum of Natural History technician. It was great to see P&C return to the roots of the series. But I still expected Agent Pendergast to be the star of Blue Labyrinth. He is not. Fighting for his life on the sideline, the spot light shifts to long time friend, Detective Vincent D’Agosta (NYPD), Dr. Margo Green (Curator, MSH) and Constance Greene (Pendergast’s ward). These three beloved characters take center stage as they try to assemble a puzzle with seeming unrelated pieces in time to save Pendergast. It was an entertaining read that revealed more about the characters than it did about the villains. 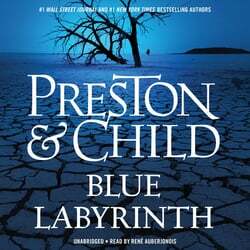 Blue Labyrinth is a solid read, with vivid depictions, three dimensional characters and plenty of the eccentricities I’ve come to expect from Preston and Child. Rene Aberjonois has one the most distinctive voices in narration. His ability to breathe life into fictional characters takes the listener inside the book from cover to cover. He uses tone, tempo, accents and pitch to make each character an individual and every setting a beautifully drawn scene. Blue Labyrinth is a good book and even better audio experience. There are flaws, but none so flagrant as to turn me away from the series. At times it felt like the authors were preparing for the demise of Aloysius Pendergast and maybe that was their intention. I’m just glad it didn’t happen in Blue Labyrinth, so there’ll be a #15.